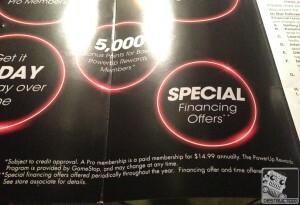 GameStop Credit Card Could Be On The Way – 26.99% Interest Rate! A new GameStop credit card could be coming your way at a whopping 26.99% (basically 27%), and here is some advice….don’t….just don’t go near it! 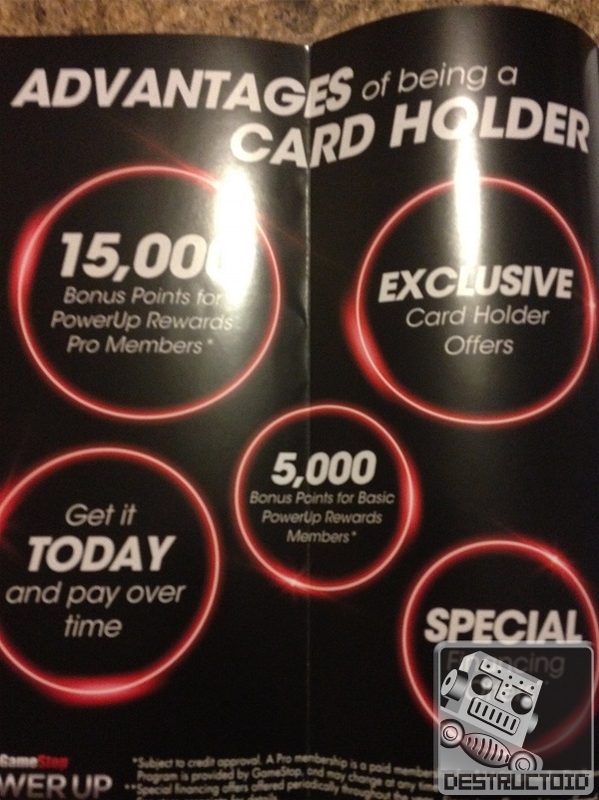 GameStop could possibly be adding a credit card option linked with their current rewards program to earn points towards discounts. This is just another way of pressuring you to fork out more when in store or shopping online. 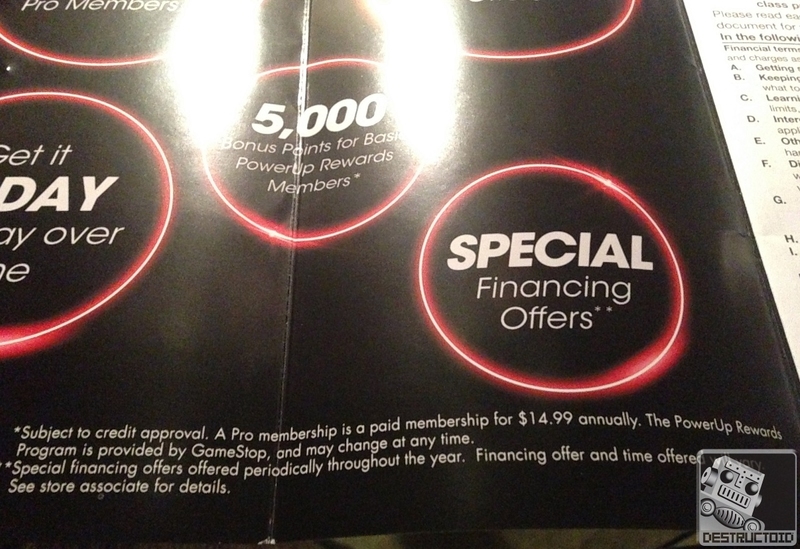 We all know GameStop already takes enough of your hard earned cash with acts, such as; cash prices being ridiculously low and a larger trade-in price to convince you to put the profits towards something in their store instead of taking money elsewhere and taking low prices for top electrical goods towards purchases at a “discounted rate”. I myself have been known to throw a few of used games towards a new release just for the pure ease. We all know we are losing out, but we sometimes just go for the easier option. But a lot of customers didn’t know this and have basically been throwing money down the drain. When it comes to used games/electronics goods, some customers are starting to pick up on how much they are left out of pocket, when they could sell their own items privately and get more profit, and then decide what to do with the cash. GameStop does little to know effort when an item has been exchanged at their store. They basically, check if it’s working, clean it, then re-sell it with a huge profit margin. Last year, Daily Finance wrote an article on GameStop’s ridiculous profit margins and also talks about the financial crisis coming their way. More evidence that the game retailer charges extortionate rates from pre-owned copies; just look at last year when GameStop were accused of being involved in a scam which involved selling ridiculous priced Xenoblade Chronicles for the Wii. GameStop were selling an extremely rare game at $90 used! Thousands of copies of the game mysteriously arrived out of nowhere to separate stores. One GameStop spoke out, saying that the retailer printed a few thousand copies of the game with no shrink wrap in order to restock the inventory and sell the game as pre-owned so they could charge more. Customers who purchased the copies of the games were speaking out about how the games looked brand new with no evidence of being pre-owned. It seems that GameStop has been taking a few steps towards keeping its stores up and running recently. The company have reportedly been in talk about paying developers to add exclusive content for their stores to increase pre-order sales. Also, in April this year, GameStop decided to shut down 120 stores due to a “a new phase of the company’s lifespan“, as spoken by GameStop’s CEO Paul Rains, and started adding mobile phones and other electronic goods stores shelf’s including sales/trade-ins for such goods. Here in the UK, we see similar game retailers doing the same. All are trying to find another way to make profit, and games in general, just don’t cut it anymore. It’s not long until we see these stores slowly close and even more so when digital content becomes the only way to purchase a game. We all know it’s coming, we just don’t know when. This is why other actions have been put into place to create a more profitable system. We already see that with the general gaming community is really impatient, hence pre-orders sales going through the roof. Do not get into debt over a games console or games. Credit cards are just too easy to use and can be a great stress on your life. 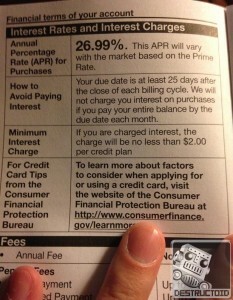 Do not opt for a GameStop specific credit card, especially when lower interest options are available. Studies have shown that internet shopping and credit cards are not seen to people as “real money” and thus the decision making process becomes less of importance in making rational spending decisions. It is still unconfirmed when/if this card will become available. 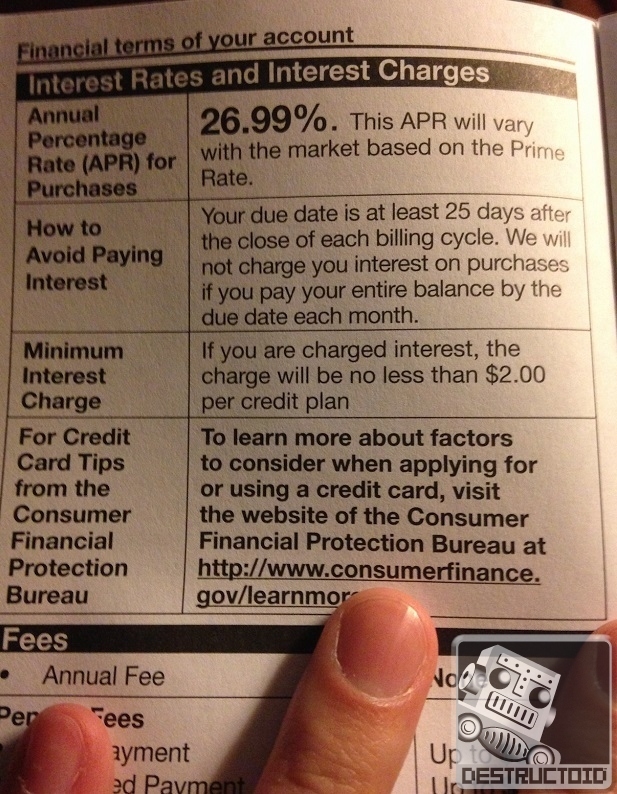 See the obtained photos below for aforementioned credit card agreement and information. This article was filed under Articles, Features, Gaming News, Site News, Tech News. Tagged with apr, conseols, credit card, elctronics, game, gamestop, gamestop sale, gamestop trade, gaming, goods, interest, points, prices, purchase, rewards.